Early spring application of a controlled release, balanced fertilizer that helps to build a strong root system while ensuring a timely green up and early color, including broadleaf weed control. Controlled release high nitrogen fertilization with a guaranteed pre emergent for crabgrass, including broadleaf weed control. Controlled release fertilization with P and K, which helps with summer stress and disease protection, including broadleaf weed control. Balanced controlled release fertilization which promotes plant strength for summer stress, including broadleaf weed control. Controlled release high nitrogen fertilization which pushes growth and enhances roots, including broadleaf weed control. Late season winterize fertilization which promotes root growth and nutrient storage, including broadleaf weed control. Our goal is to provide you with the finest lawn conditions by using quality golf course industry products applied by licensed professionals. If you are at any time unhappy with our service, we will make it right – GUARANTEED!! 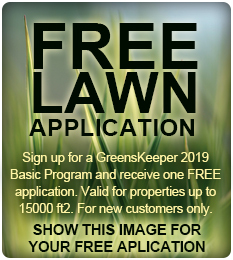 *ALL APPLICATIONS INCLUDE PROVEN GOLF GOURSE INDUSTRY PRODUCTS. OTHER SERVICES OFFERED: GRUB CONTROL, INSECT CONTROL, FUNGUS CONTROL, AERATION AND SEEDING.